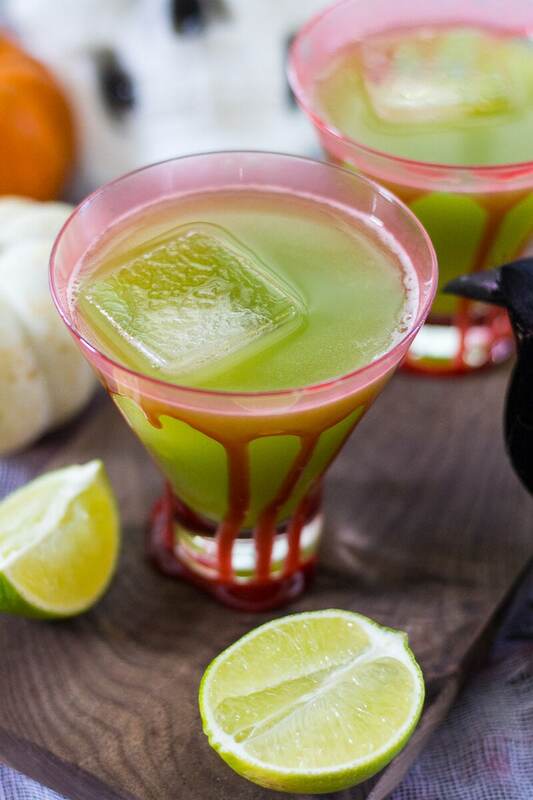 This Sour Frankenstein Cocktail is a fun party cocktail for Halloween. Don't let the green fool you: they're really just cucumber margaritas in disguise! 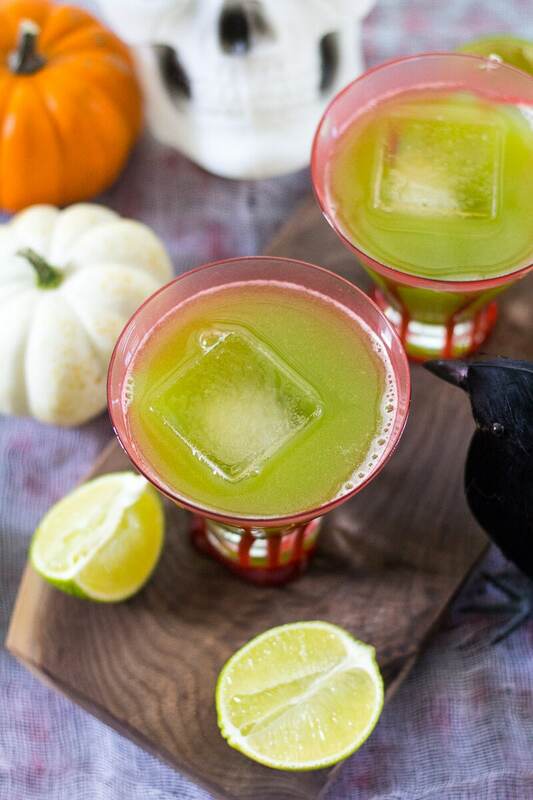 This Sour Frankenstein Cocktail is a bonus for all you Halloween lovers out there, and you don't need to cook up any crazy concoctions to surprise your party guests. I posted a Pumpkin Chai and Liquorice Martini recipe last week to celebrate Halloween, along with these delish Stuffed Caramel Apples. I'm also in love with this Candy Corn Caramel Popcorn. 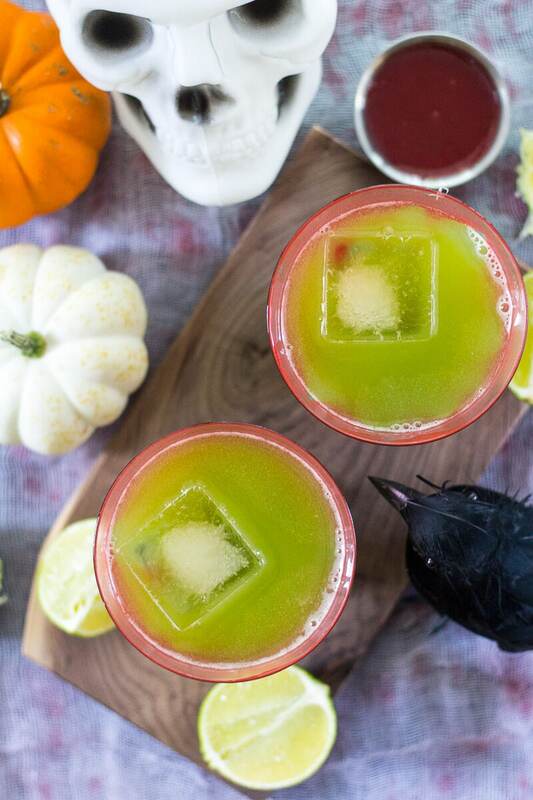 Seriously though, this Sour Frankenstein Cocktail is a flavour that everyone is going to love: cucumber margaritas! 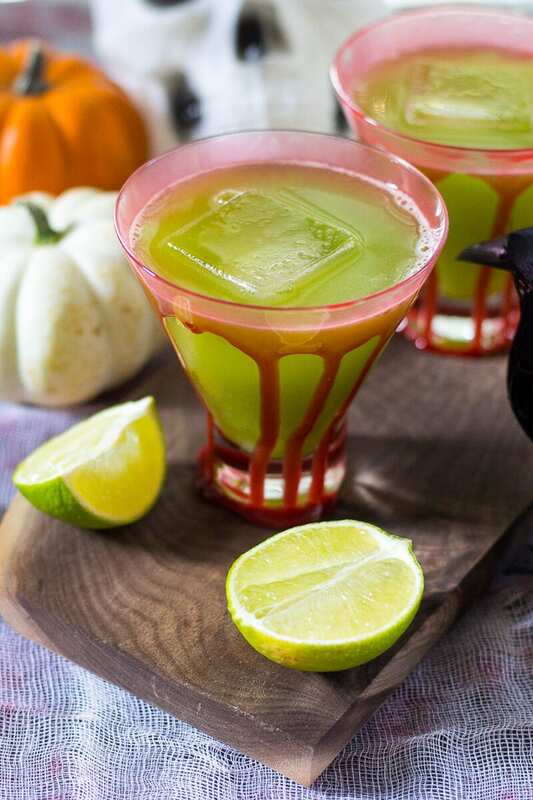 I'd like to believe that my love of margaritas is well-documented seeing as I have concocted many flavours over the years, from pineapple margaritas to prickly pear, but surprisingly I have yet to share ALL of my favourite margarita recipes. Well, friends, you're in luck, because cucumber is hands-down my absolute fave! The fake blood, well…it is optional. But why not add it on for the spooky effect right? And it's a totally edible no-brainer: CORN SYRUP and red food colouring! If you follow me on Snapchat (I'm thegirlonbloor on there, by the way), then you'll know I had a hilarious encounter with some dried up cornstarch-gone-wrong, gelatinous mess of fake blood before I turned to the interwebs for some answers. I was mixing up red food colouring, cornstarch, simple syrup and water somehow miraculously hoping that all of a sudden the mixture would turn thick enough to rim my cocktail glasses with. THEN I tried microwaving it, because that makes total sense. In my defence, I thought the heat would make it bubble and thicken up. WRONG. So Google being the delightful dear friend that it is stirred me in the direction, and boom, cocktail-worthy fake blood was born. And now you'll be the hero of your Halloween party. 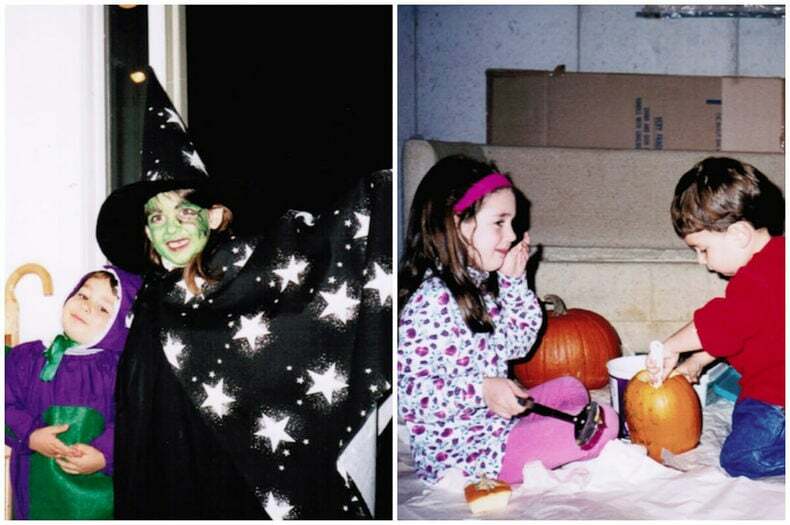 And now without further ado, I leave you with a little picture of my brother Troy and I enjoying all the spoils of Halloween as kids. Can you believe we are 25 and 21 now?! Time flies! 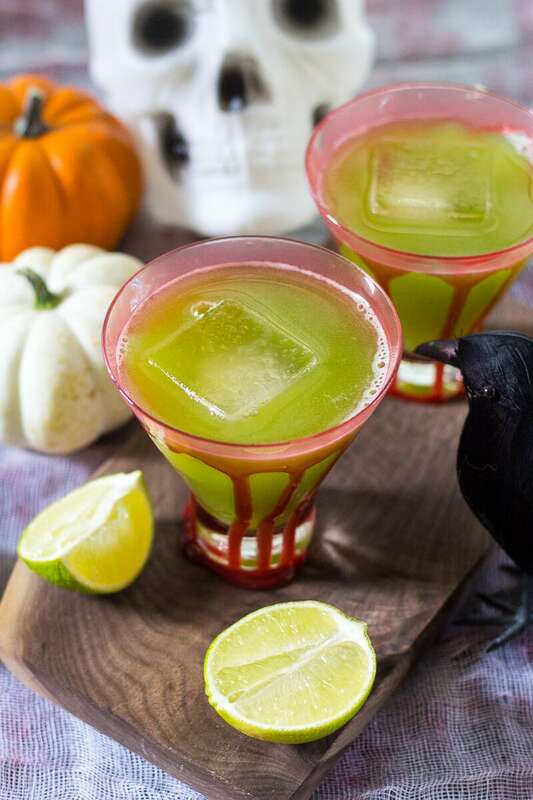 Will you be making this Sour Frankenstein Cocktail? If you try any of my recipes be sure to let me know on Instagram, Twitter, Facebook or in the comments – I'd love to see what you come up with! 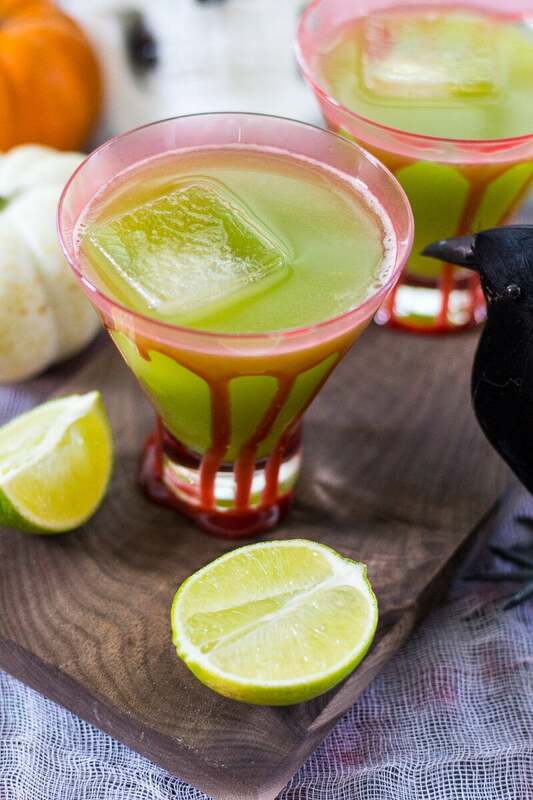 And more importantly, I'd LOVE to know what your go-to Halloween cocktail is. I always need to add more to my menu! Start by freezing glassware to ensure an extra cold glass. Mix together boiling water and sugar to create simple syrup. Put in the fridge or freezer to let cool. Meanwhile, make fake blood syrup by mixing all ingredients together in a medium-sized bowl. Freeze for 15 min. Using a blender (I love my Vitamix!) or Magic Bullet, blend water, limes, cucumber and salt until mixture is fine. Strain using a fine mesh sieve to get rid of pulp. Add simple syrup and stir well. Rim each glass in fake blood. Some of it will drizzle slightly down the sides. 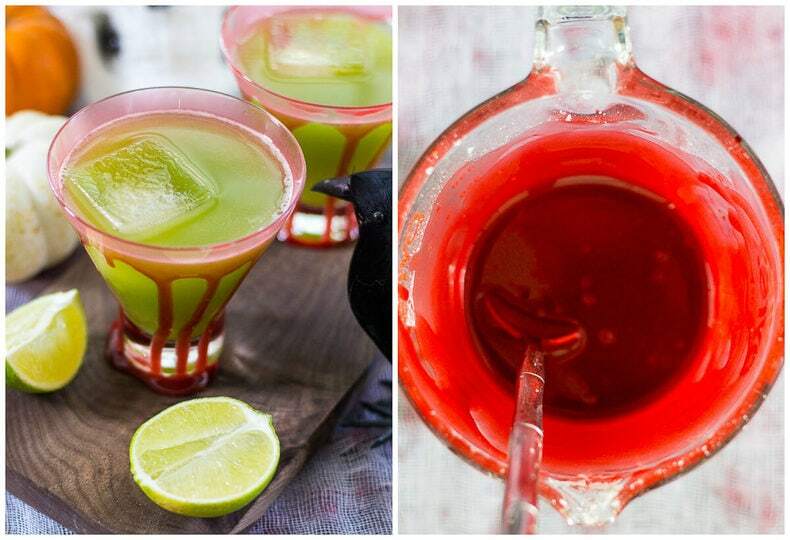 Add 1.5 oz tequila and a handful of ice to each glass, then top up with margarita mix.